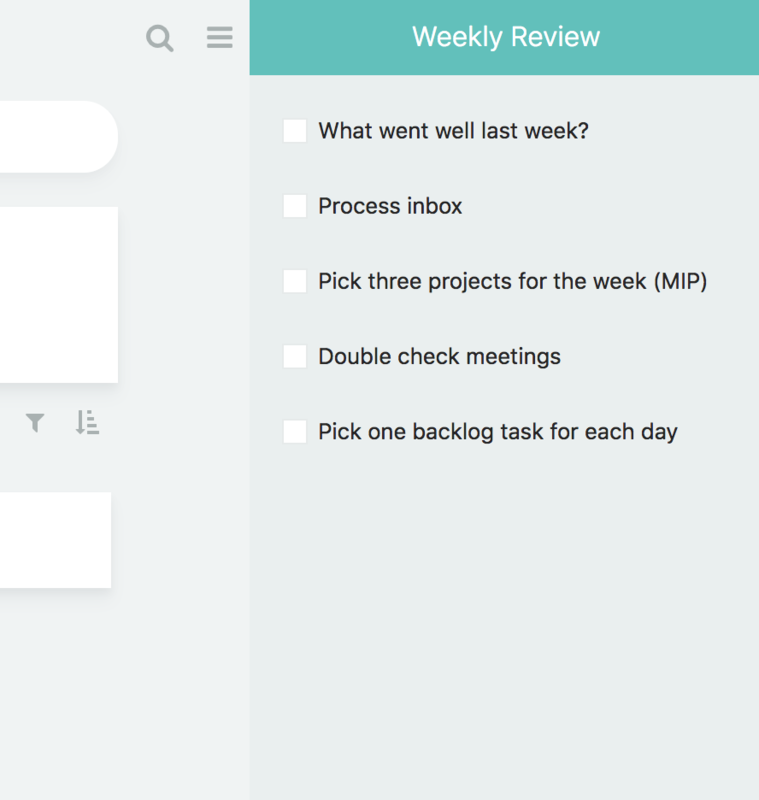 Weekly reviews are a way to maintain the system and to make sure you are regularly re-grouping and thinking systematically about what is on your plate. The weekly review strategy is a checklist that you can go through on a weekly basis to stay on top of everything. In the strategy settings you can pick the day on which you want to perform the weekly review. Also in the settings you then create the individual steps you want to perform during your weekly review. What you do during your weekly review depends on your unique workflow and setup. When you are ready to do your weekly review click in the title of the task and a sidebar with your checklist appears on the right. This sidebar is visible from all the overlays, so you can easily perform all the steps inside Marvin without loosing sight of your checklist. You can either complete your review by checking off the task itself or clicking the button inside the weekly review that appears once all your items are checked off. Clicking the colored square will open the sidebar up again. When the sidebar is collapsed it blocks other sidebars (e.g. shortcuts, task edit sidebar) from being able to pop up.